If you are planning to attend the Maha Kumbh Mela in 2013 and wondering how to reach Allahabad, read this article. The next Maha Kumbh Mela will be held in Allahabad in the year 2013, from 27th January to 25th February. Allahabad, also known by the ancient name of Prayag, is the second oldest city in India and is revered as one of the most holy places for the Hindus. The amalgamation of three great rivers of India - Ganga, Yamuna, and the mythological Saraswati, happens here; and the point where these three meet is known as Sangam. Being an important religious, educational, and administrative center of India, Allahabad is well connected to all the major cities of India via Air, Rail, and Road. 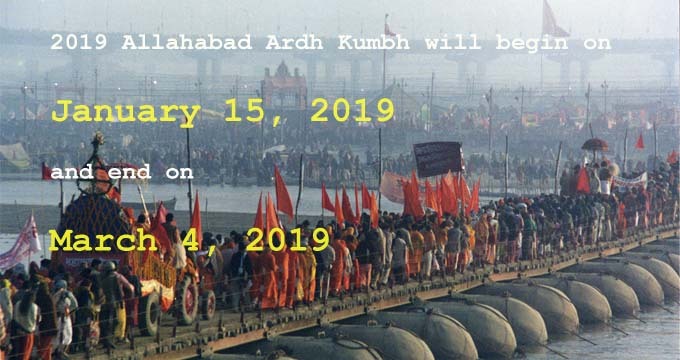 If you are looking forward to being a part of this grand gathering of millions of living souls, then brief information on how to reach Allahabad for the Maha Kumbh Mela 2013 is given below. The Allahabad Domestic Airport, also known as Bamrauli Air Force Base, is 12 Km from Allahabad and though it is operational for domestic flights, it serves only a limited number of cities in India. Other two nearest airports from Allahabad are Lal Bahadur Shastri Airport in Varanasi (150 Km) and Amausi International Airport in Lucknow (200 Km). Both these airports are well connected to rest of the major cities of India. Daily flights from major airlines like Air India, Air India Express, GoAir, IndiGo, Jet Airways, Kingfisher Airlines, and Spice Jet are available. Local cabs and Interstate buses can be boarded from near the airports to reach Allahabad. Being the headquarters of the North Central Railway Zone in India, Allahabad has eight railway stations within its city limits, all of which are well connected to many of the major cities of India namely - Delhi, Mumbai, Bangalore, Chennai, Hyderabad, Kolkata, Bhopal, Gwalior, Jaipur etc. Cabs, Auto Rickshaws, and City buses are available near all the railway stations to reach your onward destination. As Allahabad is located in the heartland of the great Indian plains, the road density is quite high in these parts and is well connected to rest of the country via National and State Highways. The NH2 runs right through the city while NH27 starts from Allahabad and ends at Mangawan in Madhya Pradesh. NH96 connects to NH28 in Faizabad and brings together two major centers of Hindu Pilgrimage - Allahabad and Ayodhya. The three bus stands of Allahabad cater to different routes of the country through interstate bus services. Local transportation like tourist taxis, cabs, auto rickshaws, and local buses are also available that connects you to various parts of Allahabad and some neighboring cities. Deluxe Hotels, Budget Hotels, Heritage Hotels, Guesthouses, Dharamshalas, and Camps; Allahabad offers all kinds of accommodations in different locations, allowing you to choose one as per your comfort. You can book Allahabad Hotels online through Online Hotels in India.